[Tech Ingredients] does a great job of discussing the basic concepts behind the turbocharger jet engine build, and how various parameters impact performance and efficiency. Through the use of various rules of thumb, developed over years of experimentation by home builders and engineers alike, it’s possible to whip up a functioning engine without too much trial and error. The video breaks down and discusses the thermodynamics at play, as well as practical considerations like cooling and lubrication, in several easy to digest steps. Jet engines are a popular high-octane build, and we’ve seen it pulled off before by makers like [Colin Furze]. The trick is to pull it off without causing yourself serious injury. There are very few machines as complex to build as a turbojet engine. The turbine blades on a commercial airliner are grown from a single crystal of metal. The engineering tolerances are crazy, and everything spins really, really fast. All of these problems aren’t a concern for [Igor], who’s building what will probably end up being the world’s smallest turbojet engine. He’s doing it in his home shop, and a lot of the work is being done by hand. We don’t know the Russian translation for ‘hold my beer’, but [Igor] certainly does. The design of this turbojet — as far as we can tell — is a centrifugal flow turbine, or something that’s not terribly different than the projects we’ve seen that turn the turbocharger from a diesel engine into a jet. The innovation here is using a lathe to machine the compressor stages by mounting an end mill to the headstock and the compressor blank on the cross slide, in a rotary table. It’s weird, but you really can’t argue with something that looks like it’ll work. [Igor] has made a name for himself by creating some crazy contraptions. The most impressive, by far, is a gigantic remote controlled plane, powered by a handmade jet engine. This is an enormous fiberglass plane with a homebrew engine that spins at 90,000 RPM and doesn’t fly apart. That’s impressive by any measure. [Igor] is posting a lot of his build process on YouTube and Instagram, including heat treating the compressor stages with a blowtorch. This is an amazing project, and even if this tiny turbine will be able to self-sustain, that’s an amazing accomplishment. You can check out a few more videos from [Igor] below. Ah, the simple pleasures of a bike ride. The rush of the wind past your ears, the gentle click of the derailleurs as you change gears, the malignant whine of the dual electric jet turbines pushing you along. Wait, what? Yes, it’s a jet bike, and its construction was strictly a case of “Why not?” for [Tech Ingredients]. They recently finished up a jet engine build using a hybrid design with electric ducted fans as compressors and fueled with propane. It was quite a success, and pretty spectacular, but left an embarrassment of riches upon its passing in terms of spare parts. The ducted fans, monstrous 90-mm 12s beasts, along with dual 150A ESCs found their way onto a mountain bike by way of a rear luggage rack. Pannier bags on each side hold the batteries, and a quick control panel went on the handlebar. The video below shows the build details and a couple of test rides, which show just how fast you can go with this setup. It may not be very practical compared to a more traditional hub motor, but it’s nowhere near as cool. Just be sure to wear your hearing protection. On October 24th, 2003 the last Concorde touched down at Filton Airport in England, and since then commercial air travel has been stuck moving slower than the speed of sound. There were a number of reasons for retiring the Concorde, from the rising cost of fuel to bad publicity following a crash in 2000 which claimed the lives of all passengers and crew aboard. Flying on Concorde was also exceptionally expensive and only practical on certain routes, as concerns about sonic booms over land meant it had to remain subsonic unless it was flying over the ocean. The failure of the Concorde has kept manufacturers and the civil aviation industry from investing in a new supersonic aircraft for fifteen years now. 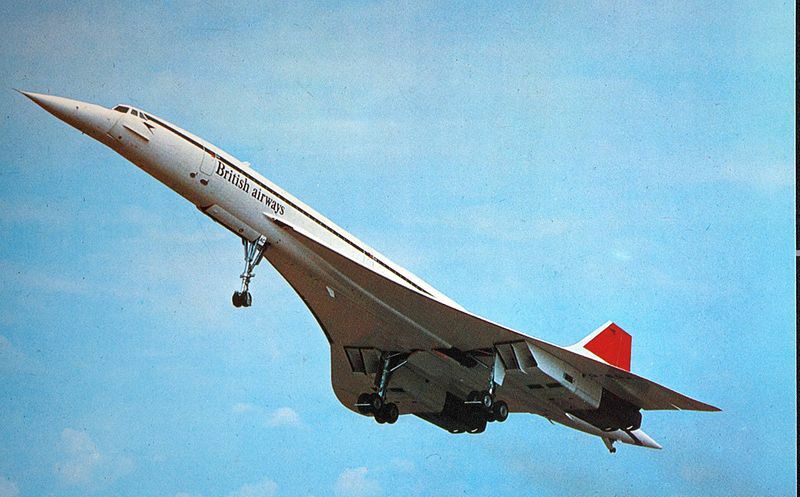 It’s a rare example of commercial technology going “backwards”; the latest and greatest airliners built today can’t achieve even half the Concorde’s top speed of 1,354 MPH (2,179 km/h). In an era where speed and performance is an obsession, commercial air travel simply hasn’t kept up with the pace of the world around it. There’s a fortune to be made for anyone who can figure out a way to offer supersonic flight for passengers and cargo without falling into the same traps that ended the Concorde program. With the announcement that they’ve completed the initial design of their new Affinity engine, General Electric is looking to answer that call. Combining GE’s experience developing high performance fighter jet engines with the latest efficiency improvements from their civilian engines, Affinity is the first new supersonic engine designed for the civil aviation market in fifty five years. It’s not slated to fly before 2023, and likely won’t see commercial use for a few years after that, but this is an important first step in getting air travel to catch up with the rest of our modern lives. If you’ve ever seen the back end of a military jet, you’ve likely seen variable area nozzles. They’re used to adjust the exhaust flow out of the rear of a jet engine during supersonic flight and while the afterburner is engaged. Commercial aircraft, with the exception of the Concorde, don’t need such fancy hardware since a static exhaust nozzle works well enough for the types of flying they’ll be doing. For much the same reasons, RC aircraft don’t need variable area nozzles either, but it doesn’t keep builders from wanting them. Which brings us to this utterly gorgeous design by [Marco Colucci]. 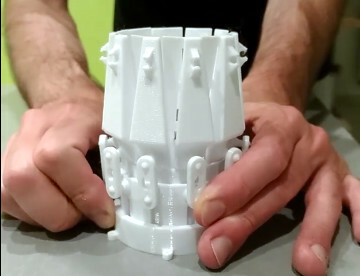 Made up of 23 individual PETG parts, this variable area nozzle is able to reduce its diameter by 50% with just a twist of the rotating collar. When paired with a hobby servo, this mechanism will allow the operator to adjust the nozzle aperture with an extra channel on their RC transmitter. The nozzle hasn’t flown yet, but a test run is being planned with a 40mm Electric Ducted Fan (EDF) motor. But thanks to the parametric design, it shouldn’t be a problem to scale it up to larger motors. But the big question: does it have an effect on the EDF’s performance? The answer is, of course, no. This doesn’t actually do anything. An EDF motor has no need for this sort of nozzle, and even if you tried to fit this on a scale jet engine, it would melt in seconds from the exhaust temperature. This is purely a decorative item, to give the plane a more accurate scale look. To that end, it looks fantastic and would definitely be impressive on the back of a large scale RC military fighter. If anything, [Marco] says he expects performance to be worse with the nozzle fitted. Not only is it adding dead weight to the plane, but restricting the air coming out of the back of the fan isn’t going to do anything but reduce thrust. But on the bright side: if it’s flying slower, it will be easier to see how awesome your adjustable nozzles look. This isn’t the first time somebody’s tried to make an electric RC plane look like it’s packing a proper turbine, but it certainly might be one of the slickest. Only way to top this is to build an actual jet engine for the thing. Designing a bi-pedal robot is a relatively straight forward task, given the array of tools that we now have at our disposal. There are many open source examples out there for anyone to get started. Designing one that doesn’t fall over a lot… well that’s not so simple. This is because when we walk our center of balance is constantly shifting, so during our adolescence we learn to shift our body weight around to maintain a stable center of balance. By the time we hit our mid-teens most of us have mastered the art of walking, and can maintain stability even through intense movements such as seen in many sports. The question is of course, how does one convey this type of learning into a bi-pedal robot? It’s not easy to say the least. Take a look at what the robotics team over at Guangdong University of Technology’s School of Automation in China are doing. They’ve strapped a pair of ducted fan jet engines to the feet of a bi-pedal setup. What this does is allow the robot to maintain its center of balance over a large distance. Generally we see bi-pedal robots “tip toe over egg shells” because they need to keep the center of balance as stable as possible. By applying a thrusting force that comes out of the foot; they’re able to maintain center of gravity even though the robot is extended well beyond its normal range of motion. Be sure to check out the video below for an excellent demonstration. Sometimes Hollywood does hackers a great service by giving us some inspiration! [InterlinkKnight]’s jet engine model is a delight to behold and to puzzle out. Many of us have been there before. We know how to build something, we know it’s not the most up-to-date approach, but we just can’t help ourselves and so we go for it anyway. The result is often a fun and ingenious mix of the mechanical and the electrical. His electric jet engine model is just that. Being a model, this one isn’t required to produce any useful thrust. But he’s made plenty of effort to make it behave as it should, right down to adding a piece of plastic to rub against a flywheel gear in order to produce the perfect high-pitched sound, not to forget the inclusion of the flywheel itself to make the turbine blades gradually slow down once the motor’s been turned off. For the N1 gauge (fan speed gauge) he built up his own generator around the motor shaft, sending the output through rectifying diodes to a voltmeter. But the most delightful of all has to be the mechanical linkages for the controls. The controls consist of an Engine Start switch, Fuel Control switch and a throttle lever and are all built around a rheostat which controls the motor speed. The linkages are not pretty, but you have to admire his cleverness and just-go-for-it attitude. He must have done a lot of head scratching while getting it to all work together. We especially like how flipping the Fuel Control switch from cutoff to run levers the rheostat with respect to its dial just a little, to give a bit of extra power to the engine. See if you can puzzle it out in his Part 3 video below where he removes the cover and walks through it all.